This is the best compact crossover for you if you like to bet on the underdog. That the Outlander Sport – or Mitsubishi, for that matter – is a crossover underdog wouldn’t have seemed possible just a few years ago. The Japanese automaker became a pioneer of the emerging compact-crossover segment when it launched the original Outlander Sport for the 2011 model year. It took its (now discontinued) Lancer sedan, gave it an SUV-style rear liftgate, and elevated the ride height to complement an available all-wheel-drive (AWD) system. Mitsubishi itself was riding high in the early-2000s, recording annual sales of more than 300,000 vehicles in the United States. It was more popular at the time than Kia, Mazda, or Subaru. Unfortunately, dubious lending practices just about sank the company’s U.S. operations during the 2008 financial crash and subsequent recession. 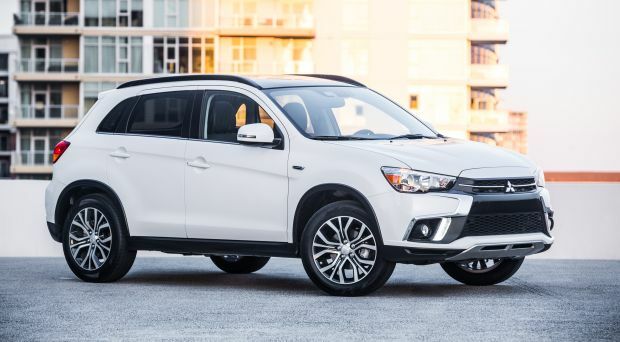 It was the Outlander Sport, along with its slightly larger Outlander compact-crossover cousin, that helped Mitsubishi Motors avoid total collapse in the U.S., a fate that befell rival automaker Suzuki in 2013. Since bottoming out in 2009, with total sales of less than 55,000 units, Mitsubishi has been clawing back. Sales topped 100,000 in 2017, for the first time in a decade. Unfortunately, both the Outland and the Outlander Sport have been surpassed by more modern rivals, although the Outlander Sport outsells such subcompact-class rivals as the Mazda CX-3, Fiat 500X, and Toyota C-HR. How’s this for advice: buy neither, at least not immediately. If you’re interested in any Mitsubishi crossover, you’d do well to wait for the new Mitsubishi Eclipse Cross to hit showrooms in spring 2018. Borrowing part of its name from Mitsubishi’s successful but defunct sporty coupe and convertible, the Eclipse Cross is larger than the Outlander Sport, has more available safety and convenience features, and is likely faster and more fuel-efficient. It’s priced similarly, too, but far more adventurously styled, looking a little an amalgamation of the Outlander and the outrageous C-HR. If that turns you off, and you’re in position to exploit a great deal on an Outlander Sport, we’d give the nod to the 2018 model over the 2019. Mitsubishi’s made minor changes to the ’18 Outlander Sport, including slightly restyling the grille and rear fascia. The lineup returns base ES and limited-production LE models, along with the midlevel SE and top-line SEL grades. The sport-themed GT has been discontinued. LED daytime running lights are standard on the SE and SEL, and all models gain a 7-inch dashboard touchscreen, with the LE, SE and SEL adding Apple CarPlay and Google Android Auto support. The SEL offers a new option package that contains valuable driver-assistance features. Styling: Outlander Sport’s silhouette hasn’t changed much since its model-year 2011 debut. That would normally work against it, but the design has aged well. It’s received a few styling updates in the intervening years, and it gets another one for 2018, including a chrome strip on the liftgate. Inside, the center console and shift lever have been redesigned, and the USB power/data port has been relocated to a more convenient spot under the climate control stack. The new console has a sliding lid, which makes it more comfortable for the driver and front passenger to rest their arms, however it suffers from a similar problem as the rival Jeep Compass. With the lid fully extended, it rests above one of the cupholders, which makes reaching an item placed there somewhat awkward. Cargo volume is slightly better than the segment average at 21.7 cubic feet behind the rear seatbacks and 49.5 with them folded. Passenger room splits the difference between smaller class rivals like the Mazda CX-3 and slightly larger ones like the Compass. Outlander Sport’s very tall driving position affords excellent forward and side visibility, though tall rear headrests obstruct the view directly aft. Said driving position also does not have an adverse impact on headroom either, even beneath the housing of the SEL’s available panoramic roof. The roof is otherwise superfluous as it’s nothing more than a large, fixed pane of glass. It doesn’t open, but its shade is power operated. Legroom is fine, but the bottom seat cushions are rather short, which results in a lack of thigh support. The instruments and controls work well. A 7-inch touchscreen infotainment system is now standard across the board. It works well, with an intuitive interface and quick response to user input. Single-zone automatic climate control is standard, the rotary knobs for which are mounted a bit low on the central control stack but not so much as to require a distracting look away from the road. Mechanical: Outlander Sport’s base engine has remained largely unchanged. It powers the ES and LE models and it’s a 2.0-liter four-cylinder with a middling 148 horsepower and 145 pound-feet of torque. For model-year 2015, Mitsubishi added a more powerful 2.4-liter four-cylinder that produces 168 horsepower and 167 pound-feet of torque. This engine is standard on the SE and SEL. Front-drive ES grades have a 5-speed manual transmission. Optional on these models and standard otherwise is a continuously variable automatic transmission (CVT). Despite the brand’s best efforts to improve drivetrain responsiveness, noise, and overall refinement, the Outlander Sport falls well short of its rivals, many of which have turbocharged four-cylinder engines. 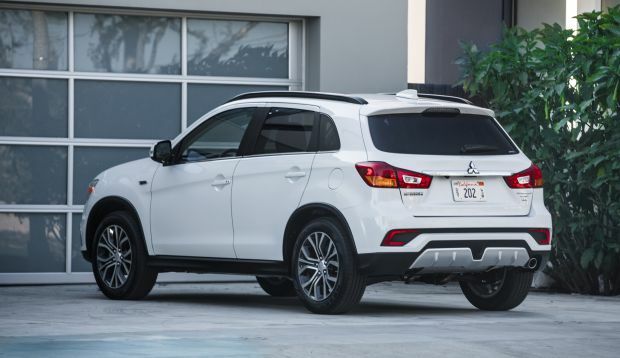 The Mitsubishi’s 2.0-liter four has always been sluggish, and the 2.4-liter feels only marginally quicker. Both sound very unpleasant when accelerating. The CVT deserves much of the blame here. Its programming conspires to rob you of forward momentum at any given time. This is done in the name of improving fuel economy, but as you’ll read below, it largely fails in that mission. Once you’re moving, things improve. All models have standard 18-inch wheels and suspension tuning that airs on the firm side of the spectrum. Large bumps crash through the body structure, but it’s not uncomfortable otherwise. Handling is surprisingly good. The tires have excellent grip, and the body doesn’t lean much in fast turns. Credit Mitsubishi’s outstanding “All-Wheel Control” (AWC) AWD system, which is built on technology derived from its departed but much-loved Lancer Evolution sports car. AWC allows the driver to switch among front-drive only, on-demand AWD, and 50/50 torque split modes, the latter of which allows the Outlander Sport to be among the best small crossovers in the snow. Features: ES standard equipment is basic, including 18-inch wheels, power accessories, keyless entry, Bluetooth connectivity, rearview camera, and automatic climate control. The LE adds black-painted wheels, HID headlights, fog lights, heated front seats, and red contrast stitching on the steering wheel, shift knob, parking brake handle, and knee padding. Moving to the SE grade adds the 2.4-liter engine, CarPlay, Android Auto, leather/cloth blend upholstery, LED daytime running lights, and pushbutton engine start. The range-topping SEL has leather upholstery, rain-sensing windshield wipers, and black roof rails. Outlander Sport pricing tracks with the subcompact-crossover class. But that doesn’t reflect actual transaction prices, which are almost certain to be far below those of manufacturer’s suggested retail. 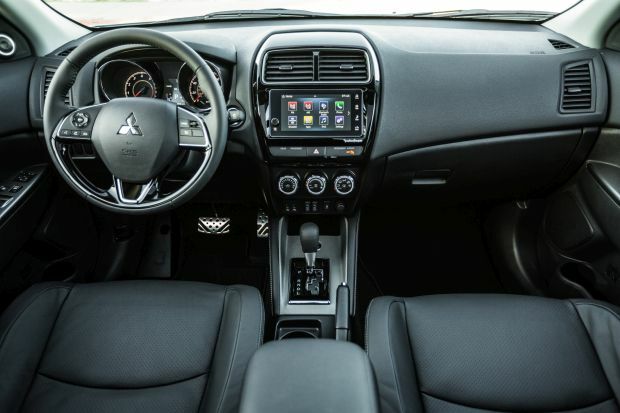 Indeed, with Mitsubishi looking to regain its foothold in the market, and resale values of its vehicles among the lowest in the industry, your dealer ought to be eager to give you a substantial discount. Note that base prices here include the automaker’s $995 destination fee. Here are 2018 Outlander Sport base prices for front-wheel drive versions; for AWD, add $1,500 across the board. The ES with manual transmission starts at $21,390; the CVT adds $1,200. With CVT standard, the LE is priced from $23,590, the SE from $23,990, and the SEL from $25,490. At $25,490, the AWD SE is probably the best value in the Outlander Sport lineup. We’re disappointed, however, that the SEL Touring Package’s driver assists are not available on all models. The only factory options are “Diamond White Pearl” paint for $200 and the SEL-exclusive Touring Package, which is new for 2018 and costs $2,000. It adds the panoramic glass roof, 710-watt Rockford Fosgate-brand audio system, automatic high-beam headlights, forward-collision warning with automatic emergency braking, and lane departure warning. Blind-spot alert and rear cross-traffic detection are unavailable. One bright spot in Mitsubishi’s picture is its generous factory warranty coverage: 5 years or 60,000 miles bumper-to-bumper, 10 years or 100,000 miles for the powertrain, and 5 years of roadside assistance with no mileage limit. Outlander Sport’s EPA fuel-economy ratings are below the class average. The manual-transmission ES rates 23/29/25 mpg city/highway/combined. With the CVT and front-wheel drive, models with the 2.0-liter engine rate 24/30/27 mpg while those with the 2.4-liter engine rate 23/29/25. AWD lowers ratings to 23/29/26 with the 2.0-liter and 23/28/25 with the 2.4. The uncooperative CVT requires you to mash the throttle to get any sort of response out of the engine, which takes its toll on fuel economy. We averaged just 24.3 mpg in a test of an AWD SEL, despite spending about half our time with the vehicle on the highway. The Outlander Sport is long overdue for a redesign, and it might happen now that Mitsubishi is under the umbrella of the Nissan-Renault Group. More likely, we predict it’ll probably solider on for another few model years as-is, especially if sales remain steady as they are now. The brand’s attention is focused on the Eclipse Cross right now, and if that takes off, that’s all the more reason to continue neglecting the Outlander Sport. At this point, it might make more sense to discontinue it outright and adapt the tiny Mirage city car into a value-priced crossover offered only with front-wheel drive. The Nissan Kicks and Toyota C-HR are subcompact crossovers that only offer front-wheel drive. This way, Mitsubishi would have two relatively fresh products in its lineup with less of risk of cannibalizing each other’s sales.